(AS FAR AS THE CHURCH, HARPERS CORNER). 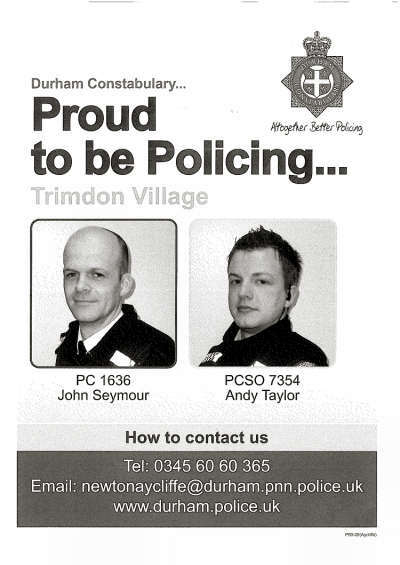 Trimdon Village, Grange and Colliery PACT. As of January 2016 there will be no further PACT meetings to attend, instead you will have a new Facebook opportunity to highlight local issues or concerns affecting your quality of life. For the first three days of the month we will create a post that will give you the opportunity to express any concerns you may have in the local area. Whilst all issues will be addressed we will select one issue as the PACT Priority for the remainder of the month. This new process is to identify monthly PACT Priorities however, should you have any other incidents to report please contact us at any time in the usual manner using 101. There have been a number of complaints raised regarding the parking of vehicles at the junction of the B1278 Salters Lane and Kielder Drive near to the Community Centre. You are advised that the Highway Code states do not park opposite or within 10 metres (32 feet) of a junction, except in an authorised parking space. Remember we would rather educate than penalise and the safety of road users and pedestrians has to be a priority. Please do not park or cause any obstructions to other road users or pedestrians, failure to adhere can result in a fixed penalty notice being issued.